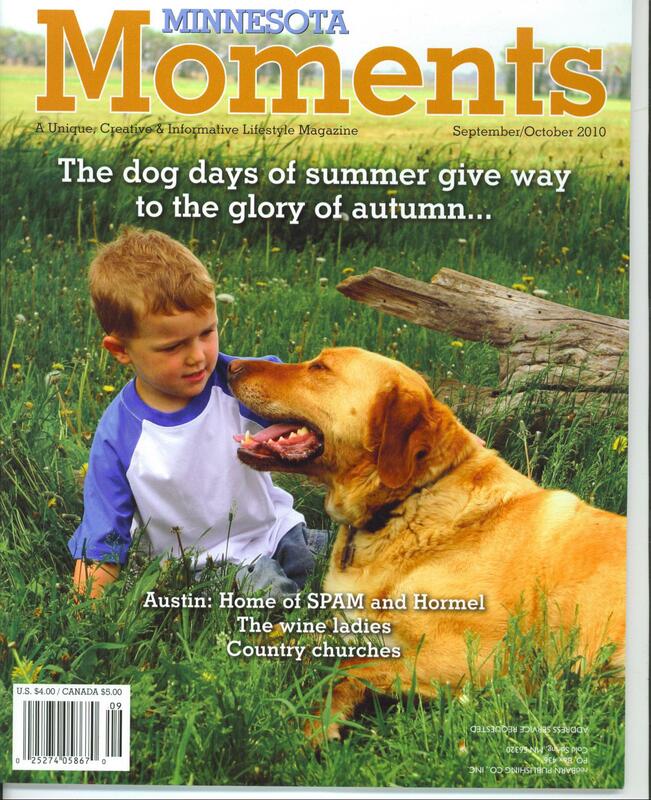 THE FALL ISSUE of Minnesota Moments magazine has just published and I’m especially pleased with this issue. Inside you’ll find an eight-page photo essay I’ve done on old country churches. Within the past year, I’ve been photographing rural churches in southeastern Minnesota, drawn by their history and beauty and by the peace I feel in their often bucolic settings. Simply put, I can’t get enough of old country churches. Sometimes I’ve even been tempted to break a lock to get inside a sanctuary. But I haven’t and I won’t. That would be a sin, and against the law. The September/October edition also includes a trio of stories from Austin, Minnesota, where I traveled in March. Downtown I discovered a kitschy little barbecue joint, Piggy Blue’s Bar-B-Que that’s a must-eat-at spot. To see the other sites I visited, you’ll need to read the magazine. I have additional stories in this issue, plus my regular reviews of three Minnesota-authored books. As always, designer Amy Stirnkorb has worked her magic by transforming my submitted stories and photos into eye-pleasing page lay-outs. Also, check out my Minnesota Prairie Roots promo on page 55 of the magazine. I designed it and I’m pretty proud of my work. I don’t claim to be a graphic designer. However, I had an idea, went with it and I think the promo truly projects my down-to-earth nature and style. See what you think and give me your feedback. Of course, I’m not the only writer/photographer for Minnesota Moments. You’ll find an interesting feature about three friends who make wine, a nostalgic garage story, some entertaining essays, squash-growing tips and recipes and lots more. Be sure to check out the ads too. Without advertising support, the magazine couldn’t exist. Minnesota Moments should arrive in mailboxes and land on newsstands any day now, so watch for it, or look for it if you’ve never seen the publication.